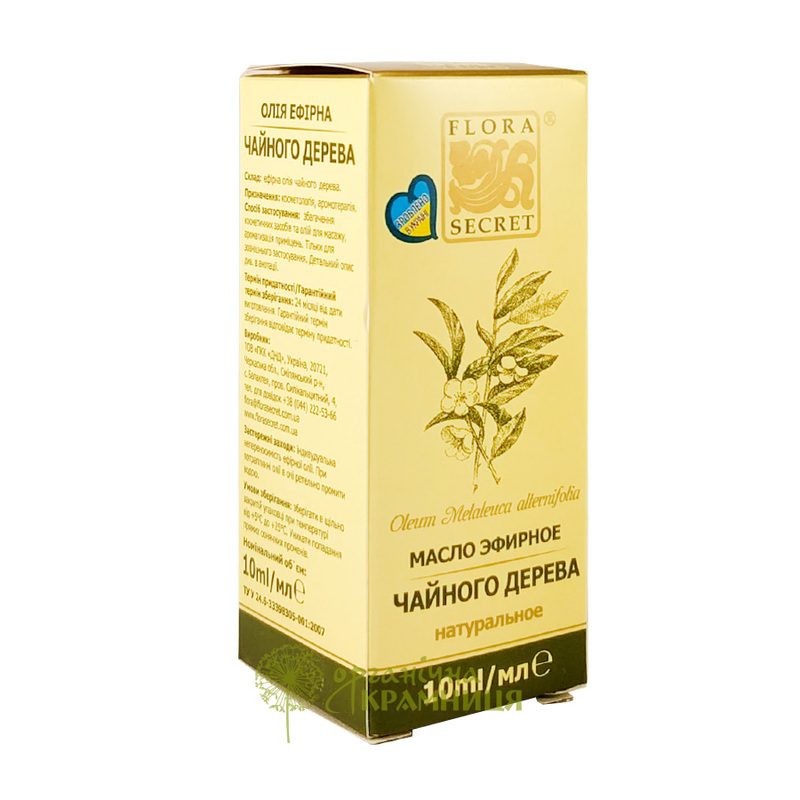 Tea tree essential oil is produced by the Ukrainian brand Flora Secret. The oil has a fresh, tart and slightly bitter scent with a hint of camphor. It provides a psycho-emotional, therapeutic and cosmetic effect. Tea tree oil can be added to cosmetic products or used in aromatherapy. Tea tree oil, also known as melaleuca oil, has a wide range of useful properties. It is known for its antibacterial, anti-fungal and antiviral effect. Tea tree essential oil can be used to improve concentration and brain activity. It relieves skin inflammation, itching and redness. Tea tree oil is obtained by distillation from the leaves of Melaleuca alternifolia, a tree or tall shrub native to Australia. It goes well with lemon oil, coriander oil, niaouli oil, thyme oil, eucalyptus oil, geranium oil, cypress oil, lavender oil, peppermint oil, rosemary oil, chamomile oil, pine oil, patchouli oil, nutmeg oil, cinnamon oil, myrrh oil, ginger oil, clove oil, and clary sage oil. Psycho-emotional effect. The smell of tea tree oil has a calming effect. It helps to relax and relieves anxiety. The oil also helps to clear the head and concentrate. Therapeutic effect. Tea tree essential oil has a strong antiviral, antiseptic and anti-inflammatory effect. It helps to boost the immune system and can be used to treat respiratory infections such as common cold, pharyngitis, tonsillitis, and others. Cosmetic effect. As a skincare product, the oil helps to treat acne, relieves itching and flaking, speeds up the healing of minor skin injuries. It can also be used as a hair care product to prevent dandruff and hair loss. Directions. Can be used to enrich cosmetics and massage oils as well as in aroma lamps. For external use only. Capable of causing hypersensitivity reactions. Ingredients. Melaleuca Alternifolia (Tea Tree) Essential Oil. Want to buy Tea Tree Essential Oil? Call us or submit your order via our web site!